Even though this isn't my subforum, I might as well start a thread for this as there is an enhanced risk in place across mainly southeastern Ohio, though central Ohio (incl. Columbus) is on the edge of the enhanced risk. There are 30% wind / 15% hail / 5% tornado probabilities so far. The 5z HRRR run tries to bring some potent looking supercells through/near the Columbus metro area and into NE OH. If that run verifies I wouldn't be surprised to see higher TOR probabilities. Earlier HRRR runs are a bit more tempered though, though suggestive of discrete storms. 0z NAM and NAM3K seem pretty nasty too, with areas of high (4+) 0-3km EHI in southern and eastern Ohio. GFS-based models are a lot more bearish though. EDIT: and the 6z HRRR run still suggests a supercell (or supercells) forming in the area of the Columbus metro, and moving into NE OH. EDIT 2: the HRRR runs since 5z (including 6z, 7z, and 8z) have been awfully persistent with forecasting discrete storms in central OH. RAP also seems to be keeping things somewhat discrete (at least in central OH) as well. 6z NAM3K is more a threat for SE OH. yes..but for those us that follow severe weather in general it's difficult to do that when there are multiple sub forums.... jumping from forum to forum when a storm crosses a magic line is annoying...plus there may be action in several subforums at the same time..
it also scatters the severe weather "experts"
Visible satellite suggesting that clearing has started in SW OH just east of Cincinnati. Warm front currently appears to be along the Ohio River at the KY/IN border, east to just south of Cincinnati. I'm starting to wonder about the area of storms forming up near Evansville and whether they might try to evolve into something more significant later in the day. A few of the models (HRRR, RAP, NAM) seem to suggest that some storms will fire up ahead of those later in the day. There's also another area of minor showers/storms east of Indianapolis, though those are currently north of the warm front, and the ones down by Evansville are in the warm sector. 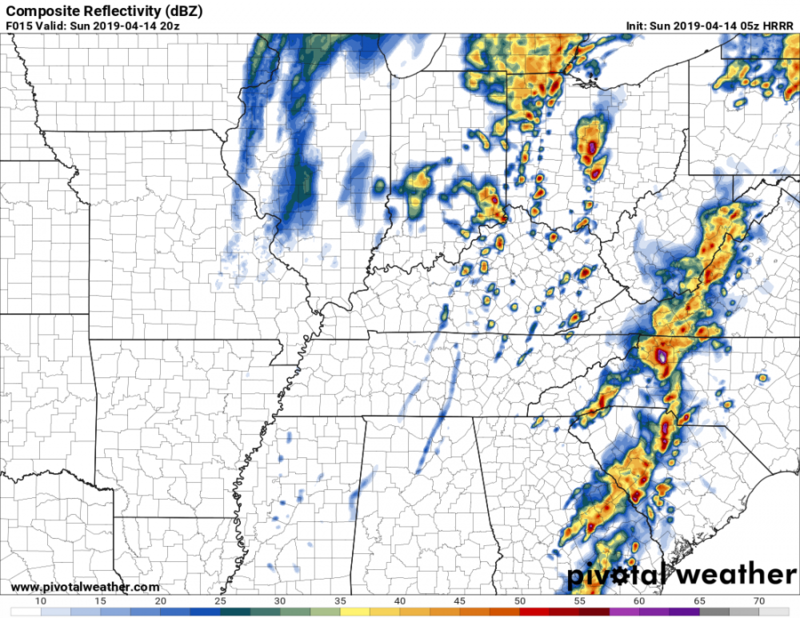 I saw that on the more recent HRRR with the Evansville storms as I wanted to glance to see if it caught on to those. I would expect a pretty rapid increase in temperatures with the clearing and we have a wind advisory for this afternoon once warm front comes through. Wouldn’t doubt on some surprises today. ILN doing a nice job in their Twitter feed keeping people updated, posted recently that the atmosphere is becoming rapidly unstable with the clearing going on and folks need to pay attention. ILN﻿ doing a nice job in their Twitter feed keeping people updated, posted recently that the atmosphere is becoming rapidly unstable with the clearing going on and folks need to pay attention. That area with the clearing near and east of Cincinnati has rapidly warmed into the mid-60s, per Wundermap. Though I'm not sure of the reliability of the observations there, some personal weather stations are showing dewpoints in the lower 60s. Rain moved out of the Columbus area quicker than I expected. Atmosphere really starting to heat up; today really seems one of those "prime" severe weather days. Will be interesting to see what the SPC discusses in their 1630z update. I'm in Ohio for college but lived in the Mid-Atlantic my entire life. I'm used to so many of these setups busting because of morning convention. Will be interesting to see what a severe weather day in the midwest is like. Those temperatures seem to be rising like a rocket ship... upper 60s to near 70 around Cincinnati now, with mid-to-upper 50s in Columbus based on Wundermap data. I'm eagerly awaiting the 1630z SPC outlook. The storms west of Louisville seem to be behaving themselves right now, but with temperatures in the lower-to-mid-70s (and dews in the upper 50s to lower 60s) out ahead of them, I don't know how much longer that will be the case. If those dews can get any higher, I bet it's only a matter of time before they strengthen. FARTHER NORTH, SUBSTANTIAL INSOLATION IS UNDERWAY ACROSS MOST OF THE OH AND TN VALLEYS IN BETWEEN THE REMNANT CONVECTIVE SWATH OVER THE APPALACHIANS AND SURFACE CYCLONE/COLD FRONT TO THE WEST. THE DEEP CYCLONE ACROSS SOUTHWEST IN WILL TRACK NORTHEAST TOWARDS THE LOWER GREAT LAKES WITH ITS ATTENDANT NORTH/SOUTH-ORIENTED COLD FRONT PUSHING EAST TOWARDS THE APPALACHIANS. THE ROBUST BOUNDARY-LAYER HEATING SHOULD SUPPORT MLCAPE OF 500-1000 J/KG AMID UPPER 50S TO LOW 60S DEW POINTS. INITIAL THUNDERSTORMS HAVE ALREADY FORMED NEAR THE SURFACE CYCLONE AND ADDITIONAL DEVELOPMENT IS ANTICIPATED THROUGH THE AFTERNOON ACROSS THE OH VALLEY. SURFACE WINDS SHOULD HOLD SOUTH-SOUTHEASTERLY JUST AHEAD OF THE LOW. THIS SHOULD YIELD ENLARGEMENT OF LOW-LEVEL HODOGRAPHS COUPLED WITH 60+ KT EFFECTIVE SHEAR TO SUPPORT A CORRIDOR OF ENHANCED TORNADO RISK CENTERED ON THE UPPER OH VALLEY DURING THE LATE AFTERNOON/EARLY EVENING. Not surprised at all. I had thought the area between Columbus and Pittsburgh was going to be the primary focus for tornadic development, but I'm wondering a bit about areas to the west of that 10% outline as well. The train of thought so far (and supported by the models, esp. HRRR) seems to be that storms will develop out ahead of those storms currently in south-central Indiana at the moment, which look like they have started to strengthen (though still sub-severe) based on the radar returns. Looks like an area of convection might be trying to go up west of Cincinnati, near Versailles, IN. Looks fairly insignificant even relative to the storms SW of Bloomington, IN for the moment, though. EDIT: Meanwhile, based on this weather station at OSU, temperatures in Columbus are rising fast. Mid-60s are already present at the time of this edit. Most of Ohio is clearing out now.. If I were chasing I would base myself at Marietta Ohio for late this afternoon and evening. Of course that is hilly terrain in se Ohio. Some storms starting to form around Berea and Winchester KY now. I'd imagine SPC will be pulling the trigger on a watch pretty soon. Convection underway along the southern IN/OH state line as well as in nrn and ern KY moving into a sneaky but good environment. Clear sector is larger than I had predicted it to be, sun about to pop out here in NW OH, so the entire south, central, and ern part of the state will be good to go for later. Definitely eying those storms near Cincinnati for sure. Seems to be a pretty good environment there per SPC mesoanalysis. The reality that there could be multiple lines or bands of storms today is a concerning factor. Can't really let your guard down in one place until the entire system has passed through your area. I doubt it, but any chance that we get upgraded to a moderate in the next spc outlook?